Kirstie received a barrage of both support and disbelief in response. I have outlined my thoughts on event management degrees in this earlier blog post: Are Event Management Degrees Worthwhile? and I am not going to go over old ground. However, I couldn’t ignore this storm completely and so I have picked out some of the most thought-provoking tweets and added some of my own thoughts below. £36K to learn events management at Plymouth University!! In the time it took you to learn & spend at uni you could reach a senior level. I feel desperately sad for anyone who wants to go to University in this age of hefty tuition fees. My student loan was around £12k after my 4 years at university studying for my event management degree (3 years studying and a 48-week work placement in year 2), but to be faced with three times this amount of debt before even graduating is a very large noose indeed. Going to university was very important to me and I didn’t want to study any other subject. It is difficult to say though what I would have done in these circumstances, particularly as I also know plenty of very capable event management graduates that don’t yet have a job in the industry or have started in an entry-level position. On the flip side, I also know talented people with unrelated degrees that have gained experience in the events industry and have proved their natural ability and dedication but that also cannot find further event management positions. Perhaps ignorance on this scale is the root of this debate?! Over the years I have met a lot of people who simply do not understand what event management is, or don’t appreciate what it entails to plan and manage an event and to make everything look completely effortless. An important skill is silently planning and managing all of the operational and logistical elements the general public are not even aware of so perhaps if we didn’t do our job so impeccably people would understand our role much better?! We constantly have feedback from clients (even those that have run numerous events themselves) that they “didn’t realize there was so much to think about in terms of events” and that “it is great working with an event management company as you think about everything, things we wouldn’t even have dreamed of.” Good to know that some people appreciate our skills at least! And no, I do not believe that an event management degree is required to hold a party and unsurprisingly being a party planner did not feature on any part of my degree course. I have not personally organised the Olympics or G8 either but I have organised lots of successful events and conferences that achieved the objectives of my clients. As a SME I have created employment for myself and others too. @martingrimsby @KirstieMAllsopp but the Mickey Mouse degrees…I agree. I can only comment on the course content of my own event management degree but I would like to point out that in simple terms it was a business and management degree focused on event planning and the event industry. It covered subject areas including marketing, human resources, law, health and safety, finance and much more. All in all, I think it is very unfair to be labelled a “Mickey Mouse” degree. Don’t get me wrong it isn’t the same as studying medicine but neither should it be compared to a studying a degree on David Beckham?! I wonder which degree courses do get the seal of approval from Kirstie and others? We can’t all be (and don’t want to be!) brain surgeons and lawyers you know! The other courses I applied and had offers for were in International Business (at the time only a handful of universities offered event management) – I wonder whether that course would be deemed worthwhile or whether that would have attracted as much scorn when actually the basic modules and content were probably quite similar? I don’t believe Kirstie went to university but as someone who has been lucky enough to work her way up and follow her dream in an unusual career I would have thought she would be more supportive of others choosing to follow their passions too. Of course, I can see the sentiment behind the tweets from Kirstie, we do want motivated self-starters and “go-getters” within the event industry and of course experience and hard work is essential. This does, however, seem to be a very simplified view of the industry and job market and very disrespectful to those doing all the right things and still finding it heart-breakingly tough to be given the chances they are striving for! In an ideal world, people would be able to breeze into a job in the events industry by showing their enthusiasm, commitment and ability to work hard and in some circumstances, of course, that may still happen. In reality though, hundreds of people apply for every single event related job and often if you are not qualified to degree level in event management or a related subject you won’t even get an interview. Remembering back to my own job hunt many moons ago the standard requirement was for a degree and 3 years minimum experience and I imagine the job market is even more competitive today than it was back then. I am not saying this is how it should be – I am purely stating the facts as they are so often reported back to me.
.@KirstieMAllsopp so would you like to send your son/daughter to a music festival for 70,000 organised by someone learning h&s on the job? @KirstieMAllsopp why don't the Government pay firms £9k a year for firms to train unpaid staff, surely it would be more beneficial. Interesting idea! Although I think this idea needs developing further I understand the sentiment behind it. A degree in event management is worth nothing without experience (and lots of it). We were not allowed to progress into the last two years of the event management degree unless we had completed our year working in the events industry and I think this is so important. Unfortunately, this element is no longer compulsory on most courses, mainly because there are not enough work placements available but also because of the high tuition fees incurred, even when on a work placement and not at university. Perhaps some of these hefty tuition fees could be used in this way though to support more work-based learning? @KirstieMAllsopp There's more to university than getting a career, its a life experience. Not everything in life can be quantified fiscally. If you are currently studying event management or have recently graduated I imagine that tweets from such a high profile TV personality seem pretty damning. All I can say is hold your head up and don’t ever give up. It’s not going to be easy but you can succeed. Please note these thoughts are not endorsing/specific to any event management degree. 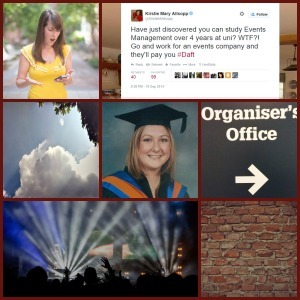 I studied at Leeds Metropolitan University (now known as Leeds Beckett University) but I graduated a long time ago and I set up my own event management company in 2004. I am proud to currently be an Associate Lecturer at UCLan, teaching Enterprise to the final year Event, Hospitality and Tourism students. I love every minute of teaching and meeting so many inspiring and capable students, passionate about the events industry, just like I was! I believe I am well qualified to comment on this subject though, having studied to degree level and worked in the events industry all my life…. I would love to hear your thoughts on this controversial debate in the comments at the bottom of the page! Being a college student at the moment, I am smack in the middle of the “what’s your major” debate. I am not persuing a degree in event management. Rather, I am double majoring in sociology and economics. However, experience is important, and so is the acquisition of industry knowledge. Which is why I volunteer, maintain a blog, take event management classes online, go to trade shows & conferences, and keep up with what the pros are reading. I think they key is to balance theoretical knowledge with hands on experience. If you accomplish that with an Events Management degree, wonderful. If you can do it without one, thats just as well. It certainly sounds like you are doing a lot to gain skills and keep up to date. I agree 100% that experience and knowledge go hand in hand. Best of luck with your studies and everything – keep us up to date!